Madeleines aren’t exactly the treat that get me jumping up and down for joy, but when done right, they could almost compete with the real desserts of the world. While Madeleines look like cookies, they’re actually small sponge cakes that are distinctively shaped like shells. Madeleines make lovely additions to sophisticated gatherings like teas, luncheons, and showers. Donsuemor recently sent me a box of Madeleines that included Lemon Zezt, Chocolate, regular, and chocolate dipped Madeleines. Mmm, I was impressed! Surprisingly so! These fresh treats smelled of rich butter and were adequately sweet for my tastes. I also loved the spongy yet buttery consistency. Well done Donsuemor! 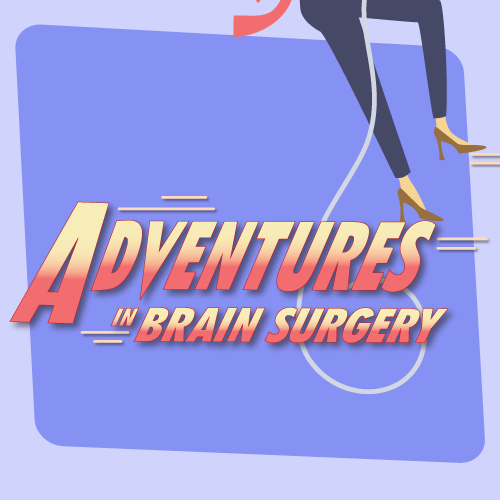 For more information on Donsuemor Madeleines, click here. 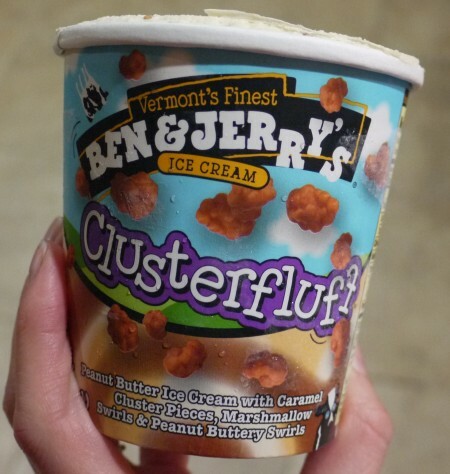 Ok, I just got the joke of the ice-cream’s name as I was writing it in Caps. Ha ha. Wow, a little slow today. Perhaps it’s all that Clusterfluff clouding my mind!!! 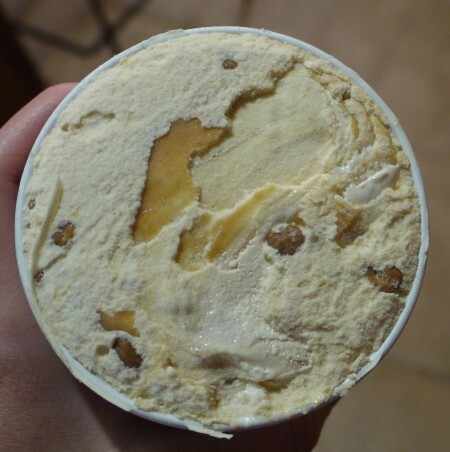 Peanut Butter Ice Cream, with Caramel Cluster Pieces, Marshmallow and Peanut Buttery Swirls. All in all, super tasty, as you’d expect from my Vermontster boys. That said, a little too salty and heavy on the PB for a solid 5-cherry review. I’m completely on a Sugar High now..@#*D!J#(UI!E@!(@#!$*A(! Today I dropped into Champagne Bakery, a chain french bakery and cafe. I wasn’t that hungry, so it delighted me to see that they offered mini portions, like the Blueberry and Strawberry Cheesecake Trifle. I opted for the mini Blueberry Trifle, which tasted like it had been sitting on the shelf for a while as the whipped cream on top had solidified into a glue-like substance. Furthermore, a strong lemon flavor alarmed my taste buds. Say what? I didn’t want a zingy lemon dessert! I wanted a cool and creamy trifle, accented by fresh blueberries. When I asked the lady behind the counter if she knew that the trifle was indeed, lemon curd, she gladly gave me the Strawberry Cheesecake Trifle for free. Wooo! That was a really nice gesture that nearly upped their cherry points (nearly, not quite). The Strawberry Cheesecake option definitely tasted more fresh and had a playful mix of consistencies with the fluffy whipped cream, chunky crust moments, smooth cream cheese center, and soft fresh strawberries. That said, the cream cheese was a bit sour (could have used more sugar) and overall, well.. I threw it away less than half way through. (Sigh).. Perhaps I didn’t choose the right desserts here, but I say pass on the Trifles when you drop in the Champagne Bakery and make sure that what you order looks fresh! For more information on Champagne Bakery, click here. 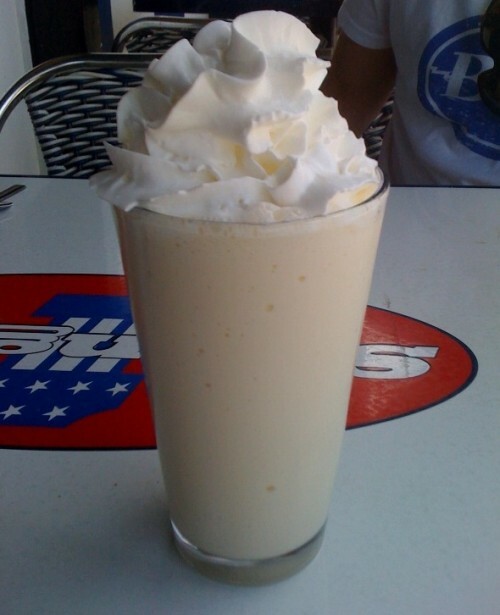 I find nothing more soothing and delightful than a fantastic vanilla milkshake. I don’t drink them often (since they sit like a 10 lb bowling ball in my stomach for hours later), but when I do, I want them to whisk me away to a heavenly place. The other day my guy and I strolled up to Swingers Diner on Beverly Blvd for a lovely weekend brunch. Before I even had a chance to see the breakfast menu though, Tyler insisted that I get a milkshake. Since he doesn’t have a sweet-tooth, I found this suggestion oddly intriguing, and really, who am I to say No to encouragement like that?! What Tyler knew, that I didn’t, was that Swingers makes the best milkshakes! I first ordered the Peanut Butter Banana shake and realized a few sips in that I was actually craving Vanilla. The PB-Banana shake was a bit strong on the Peanut Butter for me, but was still a solid 4 cherry sipper nonetheless. But the Vanilla- ohmygoodess it was Delicious! Not too thick, not too thin, and clearly made by humans mixing fresh ingredients (versus a fast-food machine). If I could have this shake every week, I would. 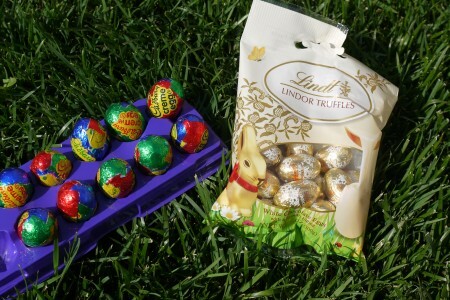 First off, I must give a very enthusiastic 5-cherries to Lindt Lindor Truffles’ White Chocolate Eggs. They could not be more creamy, dreamy, melty delicious. White chocolate can be incredibly difficult to pull off, but Lindt does a supreme job here. Like the larger Lindt truffle balls, these little eggs have liquid goodness inside, but their smaller, egg shaped proportions make for a more delicious experience. But Boo- the Mini Creme Eggs were complete rubbish. When I was a kid, having a Creme Egg in your lunch-box was the equivalent to being King of the World! I loved them more than life itself. Alas, the shells on these minis don’t even taste like real chocolate and the inside is just thick, pasty, sweet blah-ness. Boo. I can blame old age or Kraft, now that they took over dear old British Cadbury. How many Yummies can you spot above!? 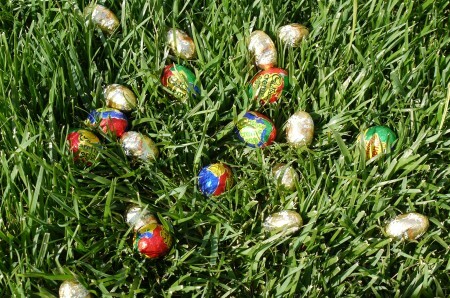 Answer: 12- remember, the Creme Eggs were total rubbish. What’s your favorite Easter treat?!? The other night I had dinner at Houston’s with friends and asked the waitress to bring her favorite dessert. 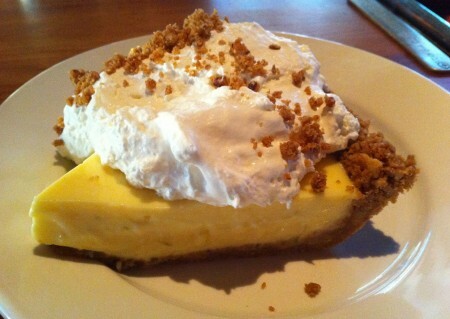 She returned with this impressive wedge of Keylime Pie (sorry that my photo is not impressive). Alas, the heaping scoop of whipped cream was utterly unsweetened and the pie itself tasted very mild. While the pie wasn’t “limey” enough for my friends, I could appreciate a more mellow interpretation of a traditionally zesty desert. Overall, it was an average but pleasant slice of pie. For more information on Houston’s restaurants, click here. Mmmm! This Carrot Cake from the Daily Grill was surprisingly delicious. I was super skeptical since I’m not a fan of chain restaurants. Furthermore, I noticed an alarming lack of frosting on the side. In fact, the back edge of the layers was downright naked. Normally, cream cheese frosting is the highlight of Carrot Cake! I love the icing lathered inside the layers, on the side, and with a decorative dollop on top! So even though the presentation with lightly whipped cream, sweet glazed pecans, and cinnamon dust looked lovely, the dearth of side icing had my eyebrows raised. Then with a bite- WOW. This phenomenal Carrot Cake shocked me. The layers were moist and delicious with a perfect balance of spices and flavor. The abundant shavings of carrots and zuchinis, along with chopped walnuts and raisins, gave the dessert delightful texture without being too chunky. Since there were six layers of cake, each sandwiched by a layer of frosting, I did not miss the extra serving of it on the side. Additionally, the whipped vanilla cream that laid on top did a wonderful job of adding a cool, sweet, creaminess to the mix. Mmmmm. Finally, I loved the sweet pecans and enjoyed them with every other bite! This Carrot Cake was a unanimous home-run at our table. Kudos to the Daily Grill on their 5-Cherry rating! For more info on the Daily Grill, click here. Today I dropped into Starbucks and sampled the 130 cal, mini-doughnuts. They never looked that appealing to me, but thought it my duty to at least try them and report back. Verdict is: they taste just like they look.. dry and uneventful. That said, the glaze on top is still nice and sweet if you want a quick, low-cal fix, and eat just the top off like I ended up doing. 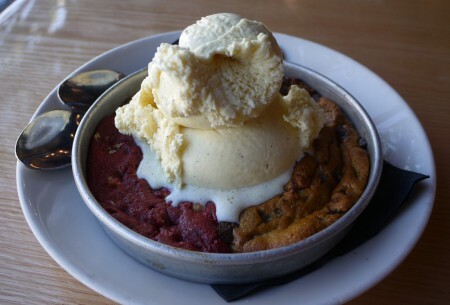 If you’re familiar with the BJ’s Restaurant and Brewhouse chain, you’ve surely had a run-in with the Pizookie. For those who don’t know what I’m talking about, a Pizzokie is a Pizza Cookie, of course! Also known as one of the greatest dessert inventions ever. However, as beautifully conceived as this concept is…a hot, melting, gooey cookie in your own little pan, topped with heaping scoops of vanilla ice cream, BJ’s falls short of brilliant by using crappy ingredients. I could tell that they didn’t use real butter in the cookies and the vanilla ice cream could not have been more bland. 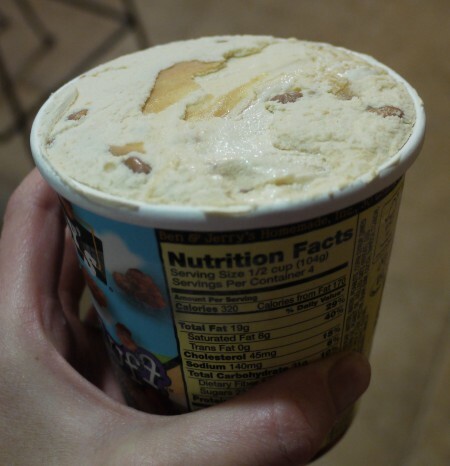 Really, it’s hard to mess up vanilla ice cream, people. Alas, I did nail the order by getting half Chocolate Chip cookie and half Red Velvet Cookie with White Chocolate Chips. The combo was awesome and the Red Velvet cookie better masked the poor quality of the ingredients. After the Pizookie, I went across the street to Diddy Riese for a good ol’ comparison. Ooooh, Very interesting. Tune in next week for the results! For more info on BJ’s Restaurant and Brewhouse, click here.